The principal of angles dictates your whole game; playing the angles and setting up in front of a shot is all about cutting down shooting space, giving you a greater chance of making the save, rather than leaving too much open and having to make every save by throwing yourself around. Learning the different angles made by standing at different will affect how you make the save and your ability to. When the play starts breaking around them, and they become locked in a scramble for the ball, it can become easy for the goalkeeper to get lost and forget their angles. The goalkeeper should be central to the ball; using an imaginary line to get square to the shot. Working on getting to know your angles will mean you know where you are in relation to them when challenging out. The centre line is the basis of every save and every movement around your goal: the middle of the goal and the goal line determine your angles; coming off the line makes the angle smaller and moving to the side cuts down the angle on your closest post, whilst making the angle to your other side larger. By checking the posts to see they are in a good position, the keeper can work out their angles to decide how far to come out. 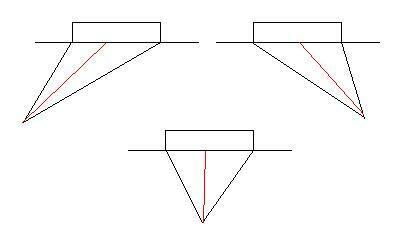 Below are diagrams representing angles set up from left and right post and central shots; the red line stands for the centre line, with the lines drawn out from the corner posts, as you would when stepping out from the goal line. Understanding the angle you cover with your positioning will help you close down the shooting space available to the attacker. Learning to play your angles will help determine how and where you make the save. By stepping out along the angle, you can actively cut down the shooting space, making it much easier to make saves as a result. Hanging back on your line leaves too much open space, turning your goal into a shooting gallery for incoming attackers to pick their spots openly. Instead, try to ‘narrow’ your angle to help you make the save; challenging the shooter for their shot. At a tight angle, with the ball in the corner or near the base line, the goalkeeper’s angle covers a small area (blocking off the post) against a shot, so they can stay near the goal. This allows you to cut off the shot tight to the post, stopping the shooter scoring there. Make sure you get your foot right on the post to stop a low ball squeaking past you! 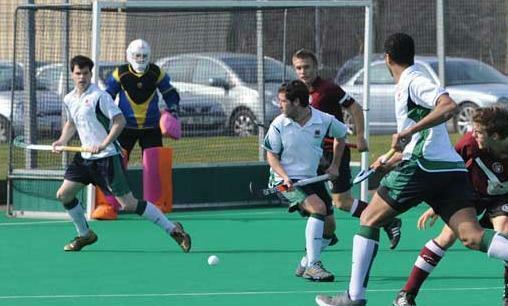 However, to prevent you deflecting a shot into your own goal, you want to stay inside the near posts. At tight angles, you always want to position yourself so any deflected shot will go outside the post. Always be square to the ball (if on the post, getting at a right angle, so you are sideways-on): use your centre line to give yourself the advantage in covering shooting space. Outside the post - woops! Ball in the net! Inside the post - ball cleared to safety. A quick way to tell if you are outside the near post is to point your arms straight sideways when square to the ball; the arm nearest the goal should point outside the near post. If it points inside the post, you need to take another step or two out. As the ball moves away from goal, the near post is not as much of a concern; your focus now is to move further out to cover the angle of the middle and sides of goal. Again, Jeff Benjamin should be credited as a source in writing this article.